For your holiday in the pearl of Abruzzo between sea and mountains, between relaxation and taste. Visit our fantastic region, the green lung of Europe, among parks and nature reserves. 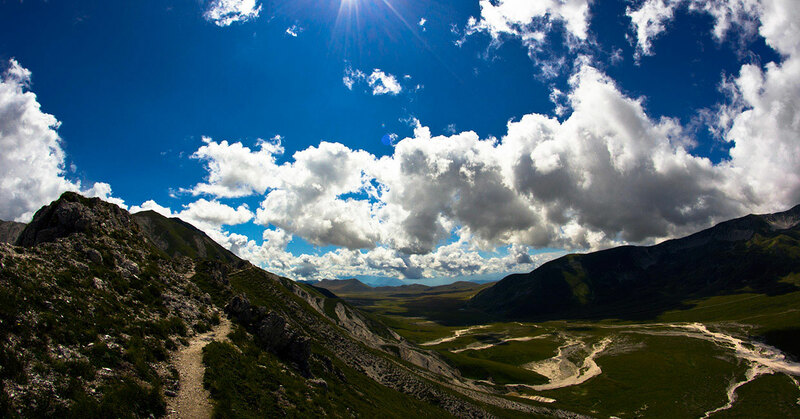 Discover the activities in direct contact with the Nature of the Abruzzo National Park! The most suitable place where to spend your holidays at the beach in Abruzzo! The Camping Arcobaleno is in a quiet area in the Southern Roseto degli Abruzzi, in front of the sea and far from the railway. Open from May, the 1st to September, the 30th, it is managed by the owners with passion and love. The Guests at the Camping Arcobaleno can spend a pleasant and relaxing stay. Equipped with electricity, in its 10.000 sm, with trees and flowers, it has 100 seats, riserved parking, showers with hot water for free, bar and market, solarium terrace, kids playground, ping pong, arcades, entertainment and much more. In the Southern of Roseto degli Abruzzi, the Camping Arcobaleno is about 1 km far from the center of our well known bathing city. Thanks to the shuttle service supplied by the Municipality, one can easily reach not only our Camping but also the bathing resorts and the golden beaches in Roseto, in Abruzzo. Our bungalows are 4-5-6 places.